PIKEVILLE, Ky. - Hot shooting led top-seeded Georgetown to a 104-75 win over No. 3 seed Life in the MSC Men's Basketball Championship game Monday at the East Kentucky Expo Center. Georgetown (28-4) captures its first tournament title since the 2015-16 season. With the 104 points, Georgetown scored the most points in a championship game since 2014 when Pikeville scored 96. The Tigers made a season-high 18 shots from beyond the arc in the game. Georgetown shot 53.5 percent from the field and 46.2 percent from beyond the arc. The Tigers had six players score in double figures led by Troy Steward who had a game-high 26 points. Joe Burton (6'6''-G) added 24 points while Brodricks Jones (6'9''-F-96) and Jacob Conway (6'5''-G) each had 14. Georgetown got off to a fast start to open up the game as they connected on their first seven shot attempts with six of them coming from beyond the arc. Steward opened up the game scoring the Tigers 12 points all coming from three and 15 of the teams first 23 as Georgetown led 23-10 with 14:19 left in the first half. The Tigers extended their lead to 47-26 with 3:06 to play in the first half with a 7-2 run. Georgetown closed out the half on an 8-3 run to take their biggest lead of the half at 60-36. Steward led all scorers at the half with 23 points on 8-of-10 shooting and connecting on 7-of-10 shots from beyond the arc. As a team, Georgetown shot 65.6 percent from the field and 57.1 percent from three. Demetrius Houston (6'9''-F-95) led Life in scoring at the half with 11 points while Evan Milligan (6'7''-F) and Jay Jay Simpson each scored eight. The Running Eagles shot 42.4 percent from the field in the half. Life went on an 8-2 run to cut the Georgetown lead to 72-50 with 13:30 remaining in the second half. Georgetown would respond by scoring nine of the next 12 points to push its lead back to 81-53 with just under 12 minutes to play. Life then scored six of the next nine points to trim the deficit to 84-59. The Tigers hit the 100 point mark with 6:13 to play propelled by a 14-4 scoring run. The two teams continued to trade baskets as the Tigers came away with the 104-75 victory. Life (19-14) was led by Houston who scored 17 points and Connor Gamble chipped in with 14. 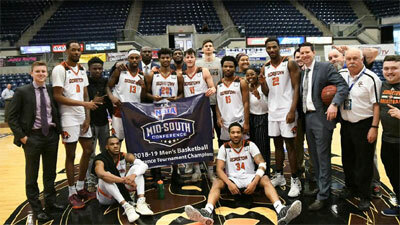 The Running Eagles will now wait to see if they receive an at-large bid into the NAIA National Tournament. Georgetown earns the conference's automatic bid into the NAIA National Tournament March, 20-26 in Kansas City, Missouri. F: EJ Onu (6'11''-F) of Shawnee St.
F: Juwan Grant (6'6''-F) of Shawnee St.